We are the best friend of your online business! We are the logistics partner on your side. Profit from our many years of experience in warehousing, commissioning, and shipping. 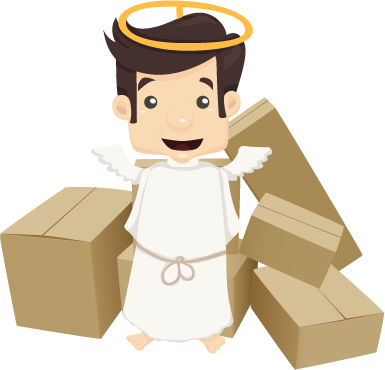 Our PackAngels will give you individual support – does your product need new labels? Or is it fragile and needs to be imported from China? We have the experience and the know-how to handle it. We store your products, commission them, and prepare them for shipment. Upon request, we can pack in logoed boxes with stickers, bows, and cards or rebate coupons – individually customized. We take care of every detail! We can also take over portioning, repackaging, and special gift packaging. An overview of stock level, shipped packages, and returns is available online at any time – everything just a click away! We’ve got your back, so you are able to concentrate on the important aspects of building your webshop: production development, sales, and marketing. When you have new ideas, we are your sparring partner to find new solutions together in order to bring your brand message directly to your customers. The best: you keep an eye on your expenses and profit from our capabilities. We work together with major international shippers and utilize the economies of scale for all of our customers. When your order volume increases, we’re there with you – in calm periods, you will have no extra expenses aside from those for warehouse space. It’s that easy! Leave it to your PackAngels and let’s grow together!